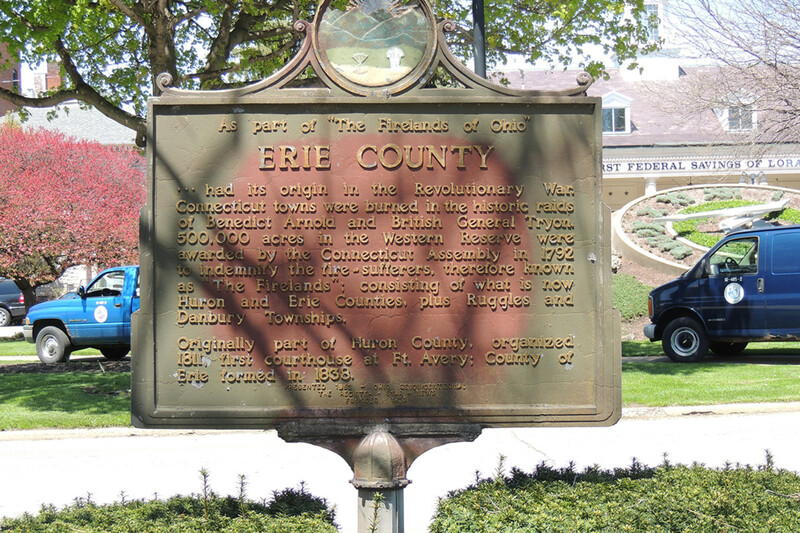 Erie County had its origin during the Revolutionary War when several towns on the Connecticut Coast were burned by the British. 500,000 acres in the Connecticut Western Reserve in Northern Ohio were awarded by the Connecticut Assembly in 1792 to indemnify the fire-sufferers. This area, which came to be known as the Firelands, was purchased from the Indians in 1805 and surveyed in 1809 when settlement finally began. The Firelands, which included modern day Huron and Erie Counties, Ruggles Township in Ashland County and Danbury Township in Ottawa County was designated as Huron County by the Ohio Assembly. In 1838, Margaretta, Groton, Oxford, Perkins, Portland, and Danbury Townships and Kelley’s Island formed the new Erie County with the City of Sandusky as its county seat. In 1840, Milan, Huron, Berlin, Florence and Vermilion Townships joined the Erie County and Danbury Township was absorbed into the newly organized Ottawa County.